You know how it is said that the only two guarantees in life are death and taxes? Well, in Rovings, I’d amend that to death and newly minted hullforms. We have one obituary this issue (see Dave Christiansen under Short Cuts), and one new hullform—the Petestep. 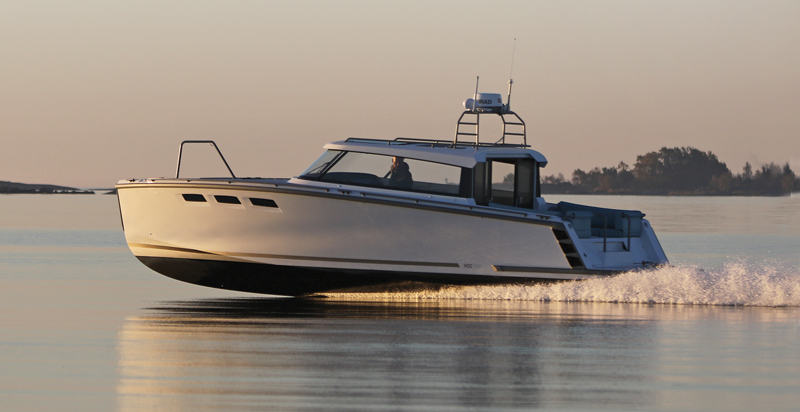 The first thing to know about this Swedish concept is it’s not a stepped hull, though the developers say it can be applied to one. Secondly, it’s a “technology” that the Petestep team works with and licenses to boat designers who develop new boats for production—up to about 50‘ (15.2m). Petestep also collects a fee for each boat produced. As with other such efforts, the objective is to capture energy otherwise wasted by spray thrown sideways. This is accomplished by “spray deflectors”—actually, carefully created planes and Z-shaped steps located between the planes on the running surface. In its customized design, Petestep says it incorporates more than “50 parameters, including deadrise angle, weight, center of gravity, projected aerodynamic area, etc.” Full-scale tests involving 100 different 24‘ (7.3m) outboard-powered sportboat prototypes were conducted, supported by a university study suggesting that this hull reduces resistance compared to a similar conventional V-bottom hull by around 35%. Part of this savings is due to reduced deadrise angles and increased lift. Working with a client, the team adjusts for the type and the performance requirements of the boat at hand. Linus Olin, a student at the Center for Naval Architecture, Department of Mechanics, KTH Royal Institute of Technology, wrote his Master of Science thesis on studies he performed of capturing the energy from spray. It is from this paper, titled “Numerical Modelling of Spray Sheet Deflection on Planing Hulls,” that both Petestep and a company with the same name took shape. To quote: “The idea behind it is that the spray could be intersected parallel to the stagnation line and subsequently deflected aftward. By deflecting the spray aftwards, a forward force is generated on the hull, thereby potentially reducing the power requirement of the boat. By intersecting the spray parallel to the stagnation line the wetted area could be reduced to a higher degree than what is possible with conventional longitudinal spray rails.” Another study cited, by H. Wagner in 1932, is said to validate reduced frictional resistance when a wedge “is dropped vertically into a calm water surface.” Hence a Petestep spray deflector. The result of Olin’s work is replacement of conventional longitudinal lifting (“spray”) strakes in favor of diagonally oriented “deflectors” or steps of varying heights (Olin tested heights between 22mm and 30mm/0.87“ and 1.2“) oriented along the delta-shaped running surface of high-speed planing powerboats. A few recreational boats have been produced to date, ranging from 19‘11“ to 33‘5“ (6.1m to 10.2m), with deadrise angles of 19.5° to 22.8°. The largest, the HOC 33, is built by HOC Yachts, owned by the same business partners as Petestep and Yacht Defined, a navigation and yacht management system that includes a widescreen display and joystick steering. For related coverage, also see our story about Ophardt Maritim’s RIBs and Norson Design’s comments about stepped high-performance hullforms. Petestep AB, Skogsövägen 22, 2TR, 133 33 Saltsjöbaden, Sweden, tel. +46 707662682.